You have worked about Oracle Database product and you want to implement about Oracle Database 11g Security. What is the idea start it? You can take the Oracle Database 11g Security Essentials course from Oracle University and the Oracle Database 11g Security Essentials (1Z0-528) exam. - Know and explain Overview of Oracle Database 11g Security options (VPD, Label Security and etc). - Know and explain about Audit Vault. - Know and explain Advanced Security Option (ASO). - Know and explain Database Vault. - Know and explain Enterprise Manager Data Masking Pack. 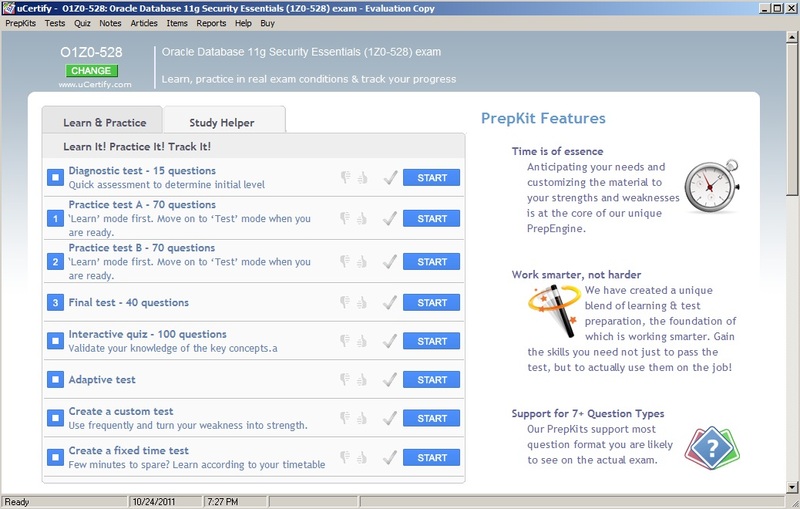 However, I am talking about the Oracle Database 11g Security Essentials (1Z0-528) exam in uCertify PrepKit tool. 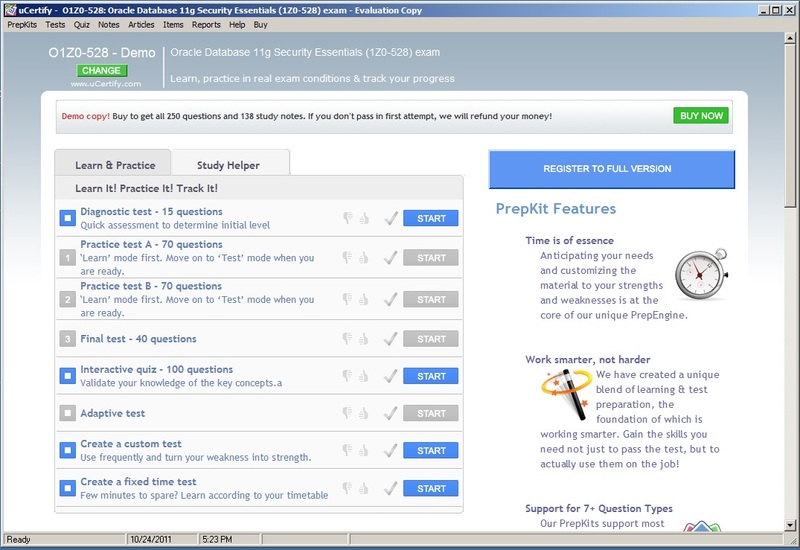 The uCertify PrepKit is the powerful tool for learning. It's not just a tool to help for exam. It's a tool for learning also. It will help you for learning: make you easy-understand in contents. You can learn and test whenever you need. 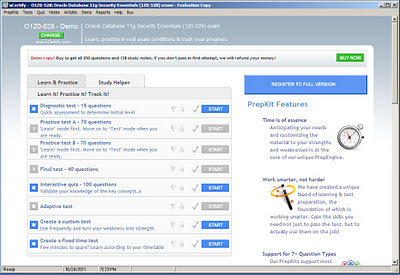 This tool has user-friendly interface, dashboard to make it easy to find what you need, good guided learning, reference notes, flash cards, pop quizzes, learning + test modes, customize tests and Study Helper(when pay FULL version). You can download "Free Trial" to review about features. On Free version, You will see 15 questions and 45 Study notes. A "Study Helper"(It helps you understand the topics clearly and provides an in-depth study of different topics) will be disabled on Free Trial version. When you pay it(Full Version). You will get 250 questions, 138 Study notes, 24x7 Support and Unconditional 100% money back guarantee!!! On Full Version, I can learn each of topics on "Study Helper" tab also. I like to learn by myself, so I believe it's good, If I can learn whenever I need, and feel enjoy to learn. 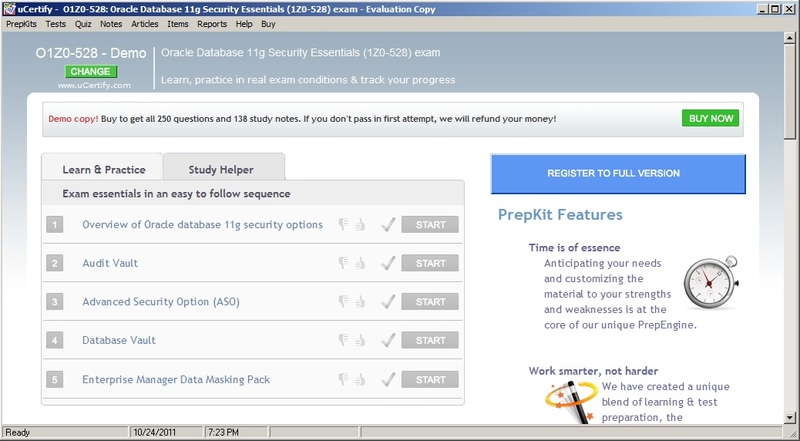 You would like to learn and take the Oracle Database 11g Security Essentials (1Z0-528) exam. 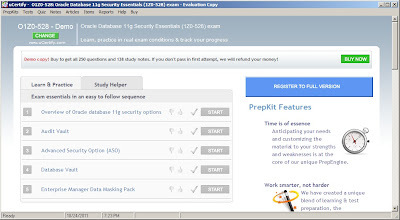 I mention the uCertify PrepKit, You will get the good experience from it and Test Pass Guaranteed. Hi. Did you take the test? Not yet. I have no time to take the certification yet. I passed this exam successfully, and this uCertify product was one of my preparation tools. (I also used the two books by David Knox, and the Oracle documentation). The uCertify GUI is excellent, with many nice features. But I do not recommend this product for 1Z0-528 exam, because the content is poor. Many questions consist of a tedious list of steps which must be ordered to complete a task graphically. (Click OK, then Next, etc.). Such questions are stupid and thankfully not part of the actual exam. The references given are too often 10g or 9i links instead of 11g. Sometimes the reference is not a link to a specific paragraph, but to a PDF of 300 pages in which you have to search yourself! For me, the uCertify 1Z0-528 requires much improvement to become advisable. Thank You Richard. good for comment with this product.